I like this app, I like how versatile it is. Lots of options to choose from to personalize. However, I feel the practice moves so quickly, I lose my meditative state trying to stay caught up. Having to pause the video and restart is quite frustrating. Overall it’s a worthwhile purchase for most. Just maybe not for me. If you are TRULY a beginner, this is too fast and without enough direction. Nevertheless, I do it everyday, set to novice, and I am still embarrassingly happy with my distorted poses and deep (in all reality, shallow struggly) breathing. I’ll be taking my talents to a local yoga class soon. I love this app so far... They personalize it to your needs and wants and change up the flows from day to day with perfect progressions. Love fitting it into my daily routine! I have tried so many workout apps and i can honestly say this is the first one i have found that is reliable, affordable, and effective. It meets my needs in a yoga workout without all the nonsense and the workouts fit my fitness level perfectly. Very convenient, calming, just what I needed! Don’t list the app as free if you need to immediately put in your acct information to use. Best yoga app I’ve tried in years. It’s worth every penny, unlike other apps that might be cheaper, but are far worse. Thank you! 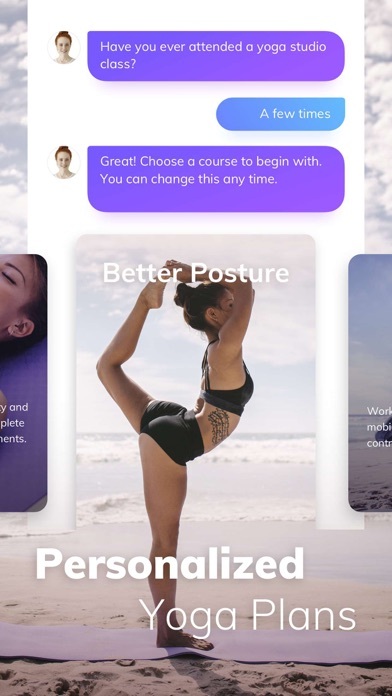 Awful app moves way too fast for a beginner that has never been to a yoga class. 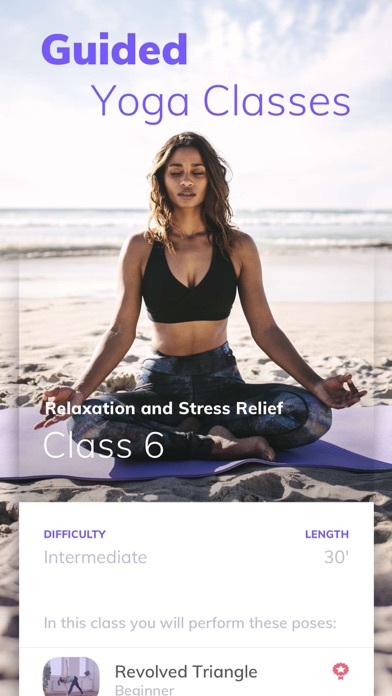 I love the app and the fact that it seems to be the best yoga app over the 5 or so that I’ve tried over the years. 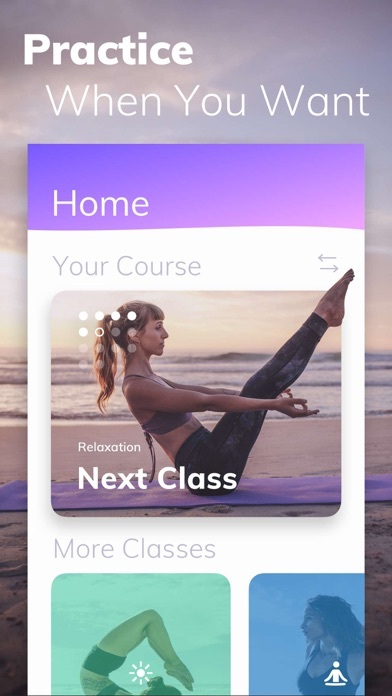 I am too busy to do a yoga class on a regular basis because of kids and work but I love the fact that I can use the classes on the app and feel like I’m getting something out of it. My only complaint is that I can’t hear any sound. I can see the video no problem but the app will not play any of the background music and I’m not sure if I’m supposed to hear talking for instruction or not. I tried to undue my free trial I wasn’t using it and I even asked for support before the free trial ended and said I can’t continue this offer because I am not using it. I got a bill today in my email saying I was charged. So not right. Love this app! It’s simple and makes beginning the practice of yoga easy for anyone! Highly recommend. I really like the presentation and everything. Instructions are clear especially with the video playing. I do however wish that they went through each move slowly and let you hold the pose instead of just flying through each one. I would still be on step 3, while the lady in the video would be on step 10. I’m not sure if there’s an option to slow it down, but i didn’t see it. Otherwise, I love the app. I wanted to work yoga into my every day morning routine. Having the option to select 15 minutes is the perfect way to get back into practice and work up to a longer flow. Higher recommend this app! Honestly, this movements is just super fast, you don’t even have time to breath and concentrate your mind like you should change positions like Sonic. You only thinking about how you should change positions. It was beginning level (but I’m not beginner) so I don’t know what on professional lever should be. O I would recommend style of Adrienne yoga on YouTube, her style nice for beginner and advanced. Worst app ever, not easy to navigate. There was no music or audio at all regardless of trying to change settings. I would essentially have to stare at my phone to know what she is doing which defeats the entire purpose of the app. I might as well just search YouTube videos on my own. No thanks. I’ve been doing this app for over a week now. I’m enjoying it and the poses and classes that they offer. However it’s very fast paced (for the strength course at least) and the voice overs sometimes don’t keep up with the demonstrations. I do really wish it was less expensive, but comparing to all the yoga classes in person in my area, it’s very affordable. Overall I’m enjoying it but I do wish it gave you more time with some of the poses. 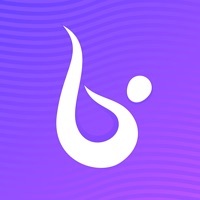 Great yoga app! I found a love for yoga last year. I have recently learned I have multiple back problems so a stereotypical workout is too challenging for me to do. Yoga is perfect. I struggle to find classes/routines I can do at home. I heard of this app and gave it a try and fell in love instantly. I’ve been doing it every day, if not every other day, and I’ve seen an extreme change in my physical body and mental state. I have more patience and more flexibility and my body is toning more then usual. This app is definitely addicting for me. This app is not free!! It’s $4.99 per week!! I like how you can personalize the background sound. I am only 2 days in so far but I love it! I’m going to continue using this app to its fullest extent. You get to pick a trainer. I chose mine based off what their bio said and felt my choice matched what I want to strive for closely. There are options depending on your experience and ability. I’m at baby steps here! There are also different types of classes such as posture or balance, core or weight loss. Currently doing posture. The poses are mixed too so even though I’m a novice there are some intermediate positions involved. Be prepared to hit that pause as with any app like this if you are struggling with a position or what to stay around a certain pose a bit longer. Current status- Novice. Terrible at meditation but determined to get there. Flexibility is about average standard for non practicing individual. Balance is wobbly. Let’s see where I can get to in a month. Will update soon! Amazing teachers and classes with just the right amount of challenge. Highly recommend to anyone and everyone. I love it so much. So soothing yet you work up a sweat too. Wonderful job creating this app. Much appreciated. Today was my first class and I’m excited to see what’s next! The music wasn’t playing, there was no words to tell me what to do, the lady was moving far too fast for me to keep looking up at my phone to see what to do next, and it hurt my neck trying to do so. There is not easy to just stop the subscription if you want to end it. I’ve completed 2 classes this week. My tracking shows one. Please explain. Some poses are easier for me than others. I do feel more relaxed immediately after class. STOP ADVERTISING YOUR APPS AS FREE WHEN THEY ARENT FREE!!!! I feel like it is SO rude to list an app as free and then make someone answer questions only to force them into a 4.99/month contract. THESE SAME VIDEOS ARE ON YOUTUBE FOR FREE. It’s working great so far. I love not having to leave my house to find a yoga studio. It works for me at my pace!! Audio didn’t work at all on my iPhone SE. I expected a lot more. This isn’t set up for those who are beginner or intermediate in yoga. It’s setup was strange. The instructor in the video spoke too quickly. I do not want to have credit card information on file in apple store. Need in-app purchase options. Or, better yet, free trial with option to pay and continue. I am still trying to figure out the app, because you sent me the class 2. The workout was great! I’d like to come back to try again. Instructions are easy to follow. I’m a beginner and I was able to follow along.